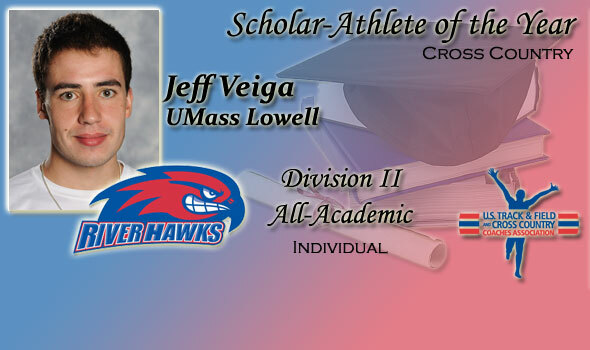 NEW ORLEANS – Jeff Veiga of UMass Lowell was named the USTFCCCA NCAA Division II Men’s Scholar Athlete of the Year for the 2010 cross country season on Wednesday by the U.S. Track & Field and Cross Country Coaches Association (USTFCCCA). Veiga was the third overall individual finisher at the NCAA Cross Country Championships this fall. Scholar Athletes of the Year are determined from among those who earned All-Academic status and placed highest individually at the most recent NCAA Championships. Veiga, an accounting major with a 3.33 cumulative GPA, was the third-place overall finisher at the 2010 NCAA Division II Cross Country Championships. In addition, the Lowell, Mass., native won the NCAA East Regional title this fall to earn USTFCCCA East Region Athlete of the Year honors. Veiga was the runner-up at the Northeast-10 Conference Championships. In addition to the Scholar Athlete of the Year, the USTFCCCA also announced those men who earned 2010 Division II All-Academic Cross Country status. A total of 182 student-athletes represent the 89 institutions that compose the group. Mars Hill led the nation with five All-Academic honorees while 11 schools tied with four nods apiece to follow. The PSAC led all conferences with 29 on the list and the GLVC came next with 15. Ten of the top 20 finishers at the 2010 NCAA Cross Country Championships earned All-Academic status, including top-ten finishers Veiga, Brandon Birdsong (Adams State), and Jordan Welling (Western Washington). In addition, two of eight NCAA Regional Champions from the 2010 season earned All-Academic honors.